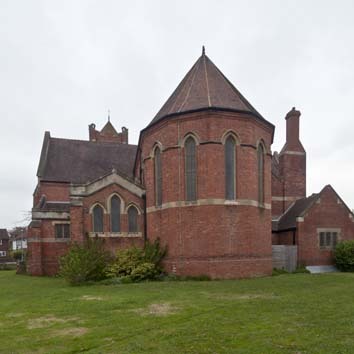 Unusually for Bexhill, the large brick church was all built at once, from 1898 to 1900 to the design of H Ward (B 75 p388), at a cost of £8000 (B 79 p15). It stands in the northern part of the town, where at the time of its building development had only started recently. 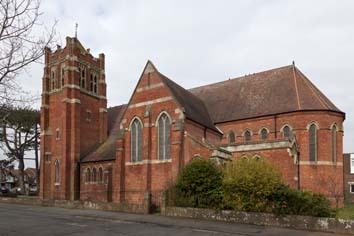 The church is best seen from the east, where its three-sided apsidal chancel and large lancets make a fine composition with the short transepts and south west tower. The styles are mixed in a way that would have been unacceptable 20 years before. 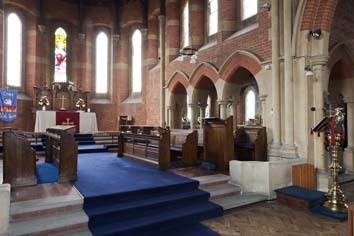 The lancets of the chancel and aisles and the Y-tracery of the transepts are compatible, but the square-headed bell-openings of the tower have panelled tracery. Above are battlements, pinnacles and a tiled pyramid. 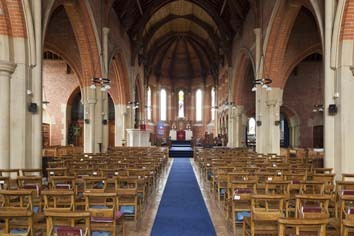 The spacious interior is mostly brick, including the arches of the arcades, and the boarded roof is supported on shafts rising from square piers that alone are of stone. There is no chancel arch – the transepts open off the easternmost arches of the arcades which are not differentiated. Low arcades with piers with double shafts lead to a south chapel off the chancel and transept. Many fittings (see below) are original. Altar rails: Jones and Willis, 1900 (BN 79 p70). Font: (Under the tower) Octagonal and intricately carved by Jones and Willis, 1900 (ibid). 1. 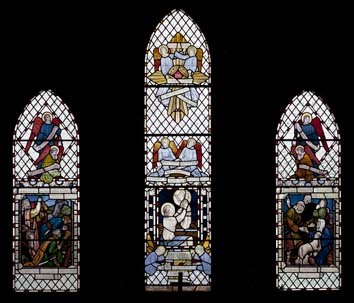 (South chapel east and two south transept south windows) H Mileham, 1935-36 (P Mileham p20). 2. (Apse, east window) Jones and Willis, 1923 (WSRO Fac 1996). 3. (Baptistery) J Powell and Sons, 1911-12 (BE(E) p122). Designed by H S Hodges (Hadley list as unidentified church in Bexhill but all other glass by Powell’s there is identifiable and the dates tally. 4. (South chancel) J Powell and Sons, designed by E Penwarden, 1907 (ibid). Lectern: Brass eagle, Jones and Willis, 1900 (BN 79 p70). 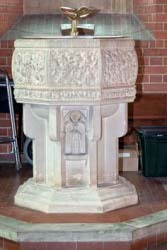 Pulpit: Stone. Ward exhibited the design at the RA in 1900 (Graves).